Periyar National Park and Wildlife Sanctuary (PNP) is a protected area near Thekkady in the districts of Idukki, Kottayam and Pathanamthitta in Kerala, India. It is notable as an elephant reserve and a tiger reserve. The protected area covers an area of 925 km2 (357 sq mi). 305 km2 (118 sq mi) of the core zone was declared as the Periyar National Park in 1982. The park is a repository of rare, endemic and endangered flora and fauna and forms the major watershed of two important rivers of Kerala, the Periyar and the Pamba. The park is often called the Periyar Wildlife Sanctuary or Thekkady. 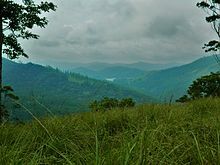 It is located high in the Cardamom Hills and Pandalam Hills of the south Western Ghats along the border with Tamil Nadu. It is 4 km (2.5 mi) from Kumily, approximately 100 km (62 mi) east of Kottayam, 110 km (68 mi) west of Madurai and 120 km (75 mi) southeast of Kochi. The first official action towards the conservation of wildlife and biodiversity in Kerala was taken in 1934 by the Maharaja of Travancore, Chithira Thirunal Balarama Varma, by declaring the forests around Periyar lake as a private game reserve to stop the encroachment of tea plantations. It was founded as Nellikkampatty Game Reserve. It was consolidated as a wildlife sanctuary in 1950 after the political integration of India. Periyar National Park lies in the middle of a mountainous area of the Cardamom Hills. In the north and the east it is bounded by mountain ridges of over 1,700 m (5,600 ft) altitude and toward the west it expands into a 1,200 m (3,900 ft) high plateau. From this level the altitude drops steeply to the deepest point of the reserve, the 100 metre valley of the Pamba River. The highest peak in the park is the 2,019 m (6,624 ft) high Kottamala, the southernmost peak in India higher than 2,000 metres (6,562 ft). The Periyar and Pamba Rivers originate in the forests of the reserve. The other prominent peaks within the park are Pachayarmala, Vellimala, Sunderamala, Chokkampetti mala and Karimala. The topography consists of steep and rolling hills which are thickly wooded. The sanctuary surrounds Periyar Lake, a reservoir measuring 26 km2 (10 sq mi) which was formed when the Mullaperiyar Dam was erected in 1895. 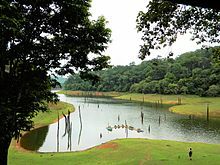 The reservoir and the Periyar River meander around the contours of the wooded hills, providing a permanent source of water for the local wildlife. The temperature varies depending upon the altitude and it ranges between 15 °Celsius in December and January and 31 °Celsius in April and May. Annual precipitation is between 2000 and 3000 mm, about two thirds occurring during the southwest monsoon between June to September. Much of the rest occurs during the northeast monsoon between October and December. Summers are warm with some precipitation in April and winters are cold. The park is made up of tropical evergreen and moist deciduous forests, grasslands, stands of eucalyptus, and lake and river ecosystems. There are many hundreds of flowering plant taxa, including about 171 species of grass and 140 species of orchids. The grasses are found in the open grasslands found on the edges of the water body where fire resistant vegetation grows and dense grasses like elephant grass are found. This is the common dining hall of various herbivores. The forests contain deciduous and semi evergreen trees like teak, rosewoods, terminalias, sandalwoods, jacarandas, mangoes, jamun, tamarind, banyans, sacred fig, plumerias, royal poinciana, kino tree, bamboos, and the only South Indian conifer, Nageia wallichiana. The medicinal gloriosa lily grows in the park. The endemic flora includes Habenaria periyarensis and Syzygium periyarensis. The park is surrounded by agricultural regions, especially plantations of such crops as tea, cardamom, and coffee. Herd of Indian bisons, gaur, at the Periyar Lake. There are 35 species of mammals recorded in the park, including many threatened species. It is an important tiger and elephant reserve. A total of 35 Bengal tigers were counted across 925 square kilometers of the park in 2017. It is valuable for Indian elephant and also for a few of white tigers found here. Other mammals include the gaur, sambar, wild pig, Indian giant squirrel, Travancore flying squirrel, jungle cat, sloth bear, Nilgiri tahr, lion-tailed macaque, Nilgiri langur, Salim Ali's fruit bat, stripe-necked mongoose, and Nilgiri marten. About 266 species of birds can be seen in the park, including migrants. Endemic birds include the Malabar grey hornbill, Nilgiri wood pigeon, blue-winged parakeet, Nilgiri flycatcher, crimson-backed sunbird, and white-bellied blue flycatcher. Other birds include the black baza, spot-bellied eagle-owl, Nilgiri thrush, little spiderhunter, rufous-bellied hawk-eagle, brahminy kite, great hornbill, Sri Lanka frogmouth, Oriental darter, and black-necked stork. A four-day survey was conducted on December 1–4, 2016, organised under the aegis of the Periyar Tiger Reserve (PTR) and found the presence of 13 new bird and 16 butterfly species that were undetected earlier. The newly found bird species included Eurasian woodcock (Scolopax rusticola), steppe gull (Larus fuscus barbensis), grey-necked bunting (Emberiza bruniceps) and paddyfield warbler (Acrocephalus agricola). There are 45 species of reptiles: 30 snakes, 13 lizards, and two turtles. Snakes include the king cobra, Malabar pit viper, and striped coral snake. Amphibians in the park include caecilians, frogs, and toads. Species include the Malabar gliding frog, Asian toad, fungoid frog, and bicolored frog. There are about 40 species of fish in the local lakes and rivers include the Periyar trout, Periyar latia, Periyar barb, channa barb, and Travancore loach. There are about 160 butterfly taxa, including the South India's largest butterfly southern birdwing, lime butterfly, Malabar tree nymph, the highly threatened Travancore evening brown, and many kinds of moths, such as the Atlas moth. A survey jointly conducted by the Periyar Tiger Conservation Foundation, Indian Dragonfly Society and the Forest and Wildlife Department on October, 2017 found 77 species of odonata including Asian emerald (Hemicordulia asiatica). A survey jointly conducted by the same team in September 2018 found eight more new species. 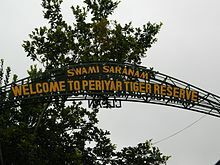 2011 - The management of Periyar Tiger Reserve has been assessed as "very good" by the National Tiger Conservation Authority and the Union Ministry of Environment and Forests. It is estimated that the Periyar Tiger Reserve (PTR) provides flow benefits worth 17.6 billion rupees (1.9 lakh (190,000)/ hectare) annually. Important ecosystem services included gene-pool protection (7.86 billion), water provisioning to districts of Tamil Nadu (4.05 billion), habitat and refugia for wildlife (3.55 billion), employment generation for local communities (25 million), water purification services to nearby towns and districts (483 million) and recreation value (425 million). ^ "Periyar Tiger-Wildlife Sanctuary in Kerala". Retrieved 8 June 2014. ^ "STUDIES ON THE FLORA OF PERIYAR TIGER RESERV" (PDF). India: Kerala Forest Research Institute. 1998. p. 8. Retrieved 24 January 2016. ^ a b c d e Flora - Periyar Tiger Reserve. Department of Tourism, Kerala. ^ Mammals - Periyar Tiger Reserve. Department of Tourism, Kerala. ^ Birds - Periyar Tiger Reserve. Department of Tourism, Kerala. ^ Reptiles and amphibians - Periyar Tiger Reserve. Department of Tourism, Kerala. ^ Fish - Periyar Tiger Reserve. Department of Tourism, Kerala. ^ Butterflies and moths - Periyar Tiger Reserve. Department of Tourism, Kerala. ^ "Survey finds surprise sighting of Indian Emerald dragonfly". The Hindu. 2017-11-01. Retrieved 15 September 2018. ^ "Kerala: Endemic dragonfly species reported after 80 years at Periyar reserve". 2017-11-01. Retrieved 15 September 2018. ^ "Eight new species of dragonflies found in Kerala". Manorama Online. 2018-09-10. Retrieved 15 September 2018. ^ Sudhi, K. S. Acclaim for Periyar, Parambikulam tiger reserves. The Hindu May 17, 2011. ^ Pillai, P. T. M. Ponnambalamedu comes under Periyar Tiger Reserve. IBNLive.com India, January 28, 2012.